Well of course I had to do themed shots for my personal most awaited movie of the year! When it comes to superheros, my heart belongs with the DC universe and Batman triumphs everyone. Unless is comes to the bad guys, then I can't pick, because they all are my favourite! But I had to pick 5 for this post, so Sheehan and I took our pick. While we planned, executed and aimed for this post to go live just in time for the movie, due to a crashed hard drive, that wasn't possible. But here we are again. We picked picked the Joker, Harley, Deadshot, El Diablo and the Enchantress and carefully planned to add their essence and colours into each shot. The Joker is the craziest villain ever created. He is about chaos and is a complete megalomaniac. He sweet talks his way through most things and is a complete charmer. 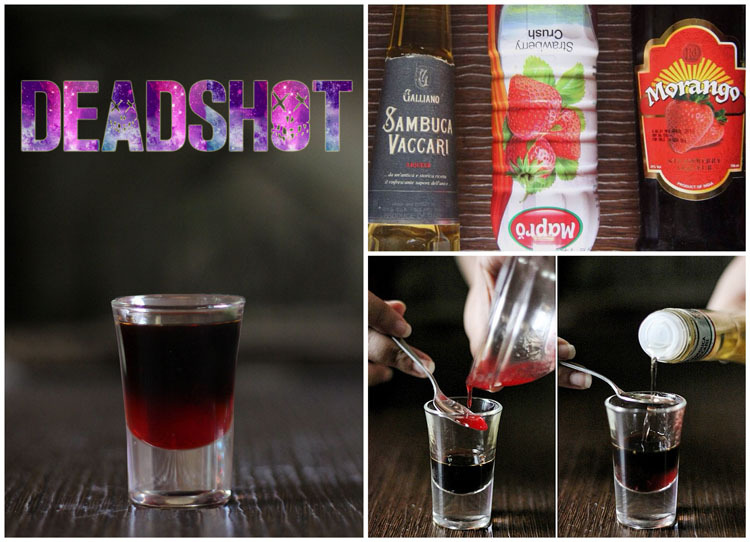 We decided to pick on the sweet side and create a shot that was too sweet to handle. 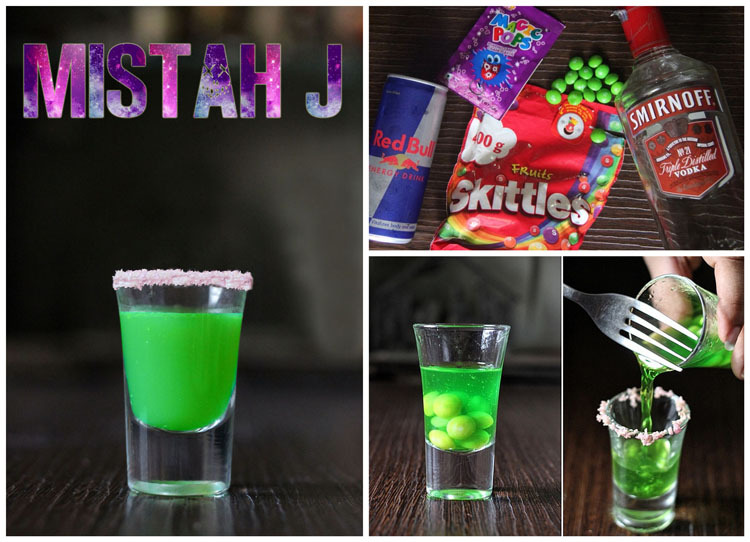 In came the skittles that was infused in vodka, which provided the green hue to it. Topped off with Red Bull and a rim of Magic Pops, this concoction is a surge of unstoppable energy. Sheehan and I were aiming for a purple rim, as it seems more Joker-esque, but the grape Magic Pop turned out to be a light shade of pink. Coincidentally, Jared Leto wore the exact same colour combination to the European premier of the movie, that took place almost a week after we created these. WIN! On to one of your favourite characters who we've all been extremely excited to see on the big screen for the first time, we knew Harley's shot had to be taken to another level. For that fun and crazy element, she needed a jello shot. We also needed to get her colours right. The vodka and cranberry made up the red jello part while the blue curacao made up the blue. 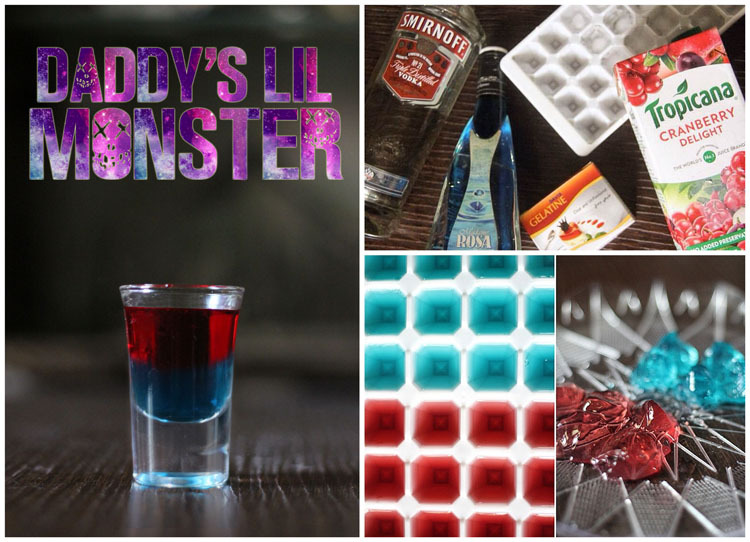 We used plain gelatin, because we wanted to add cranberry to make our shot taste like a cosmopolitan. Another alternative is strawberry gelatin. For the man who never misses, our shot was pretty straightforward. We needed something a little dark with a hint of red. I don't need to go in detail about what the red is supposed to represent... Layering the shot and getting our desired effect wasn't as hard as I thought it would be. We added the liqueur first and then added a tiny spoon of strawberry crush, which sank to the bottom and gave an ombre "bleeding" effect. Finally we topped it off gently with Sambuca, again with a spoon, so as not not upset the pre-existing layers. Sambuca generally comes in a clear form, but we had a tinted version that worked perfectly for our drink. An alternative for this drink could be Kahlua and would make a nice strawberry flavoured coffee shot. Morango is an Indian strawberry liqueur that seems to be really hard to track down. It's distilled in Goa under Rhea Distilleries. It's a great ingredient for cocktails and you should definitely pick a couple of bottles during your next Goa vacation. I was very excited to make El Diablo's shot. This was another no brainer and we needed to have fire and tequila together, so we stuck to the basics and added a base of Kahlua. 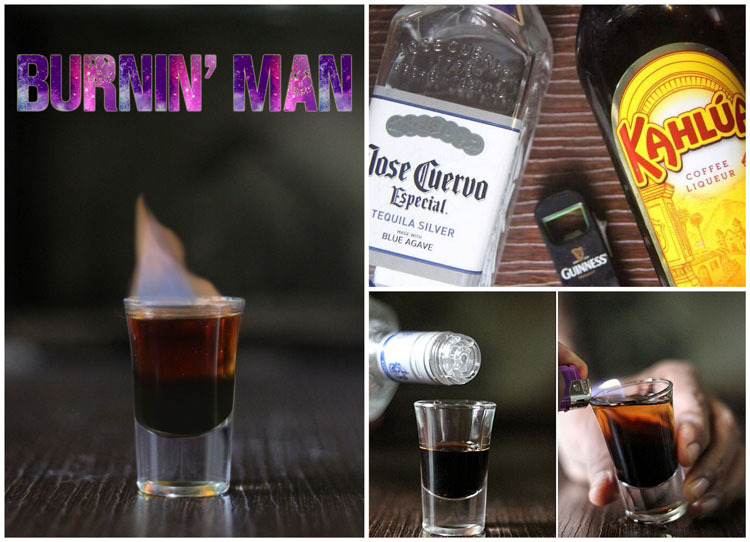 Creating a flaming shot takes a lot of practice. I still have never flamed one myself, our dad did this for us. Do not, I repeat DO NOT consume a shot while it's still flaming. Never try to blow off the flame either. The consequences would be scarring. Instead, cup the rim of the glass to let the flame extinguish and then drink your shot. Last but not the least, we picked another female character, who if you've seen the movie already, plays a vital role. The trailers showed us a murky looking character and so we wanted to imitate that style, but we also wanted to add the green element as the Enchantress has always been depicted as such in the comics. So our shot had to be murky green. We followed the same system of layering as we did with Deadshot. 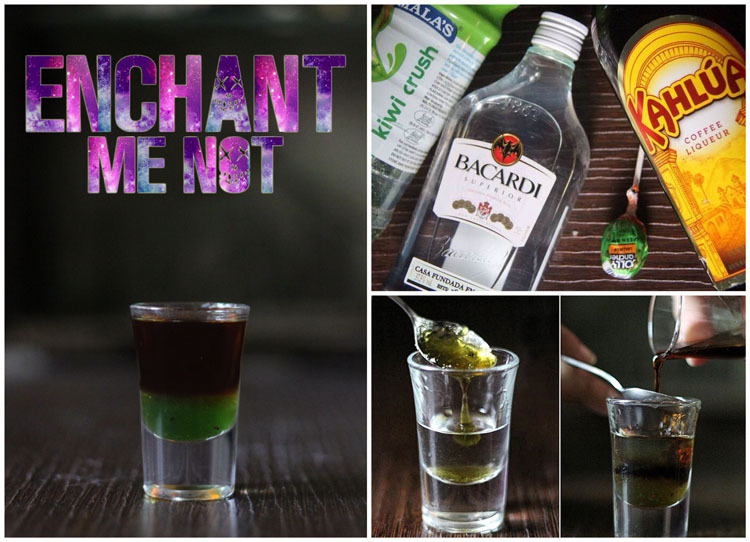 First the white rum and then a mixture of the kiwi crush and melted jolly rancher for flavour. The we topped it off with Kahlua. 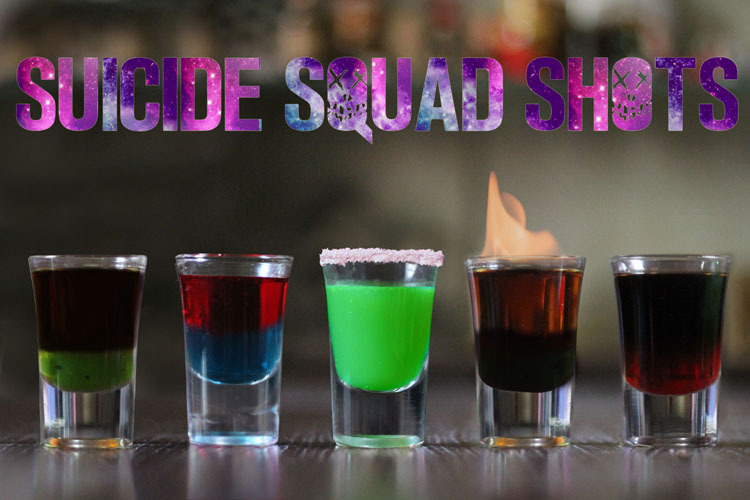 And so there you have it, our Suicide Squad shots featuring 5 of our favourite characters from the movie. These look phenomenal - I love the thought you've put into each of the recipes!